According to the official information from Gridseed one 80-chip Blade Miner is equivalent to 16 Gridseed 5-chip USB miners and it is capable of providing a total hashrate of 5.2 MHS. So we have fired up bfgminer with the Blade Miner configured to run at the stock 600 MHz, the default frequency for the 5-chip miners to see what kind of performance we can get. A bit of a disappointment as we got just about 4 MHs total performance from the two PCBs with 40 chips each that combined make the 80 chip Blade Miner. And since the Blade miner has two PCBs with 40 chips each and different power supply and USB connection in the miner software you see it as two separate devices. If you were hoping that the new Gridseed Blade Miner will be capable of 5.2 MHS as per official specifications at 600 MHz, you will probably not be very happy as it seems that Gridseed has apparently decided to overclock the device and cite specifications at higher clocks. So we went further and ran bfgminer at 700 MHz frequency to see the performance level that we can get and we got a combined hashrate of 4.6-4.7 MHS, so still a bit below the official specifications. Running bfgminer at 800 MHz has allowed us to get us a bit higher than the official specs of 5.2 MHS, we got at up to about 5.6 MHS with these settings with no HW errors to just a few. This means that you can expect to easily run these miners at 800 MHz with no problems and get a bit over the official specs in terms of hashrate. We went down to 750 MHz just to check that with it we are actually getting around 5-5.2 MHS hashrate from the Blade Miner, so that is around the “default” frequency that the new Gridseed Blade miners are supposed to be ran in order for you to get about 5.2 MHs. 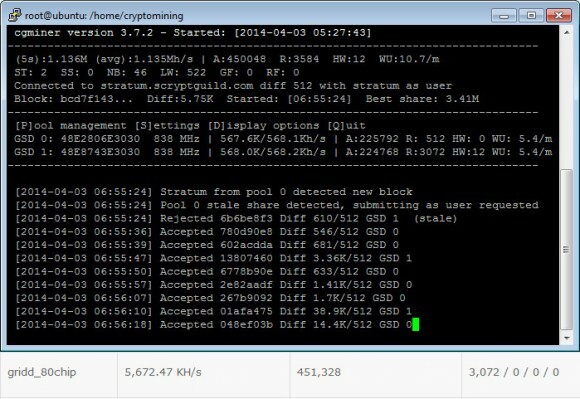 The image above shows the actual poolside reported hashrate, the first result is from a voltmodded 5-chip Gridseed ASIC running at 490 KHS local hashrate and with 64 worker difficulty and autoswitching to the most profitable coin at scryptguild. 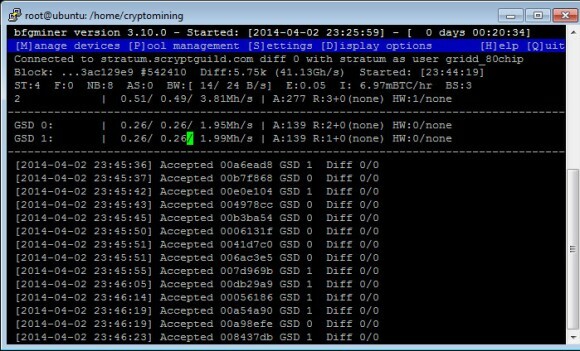 The second worker is the new Blade Miner running at 256 worker difficulty and manually selected to mine for LTC with a hashrate of about 5.6 MHS or pretty much the same as the locally reported hashrate. We have found out that setting the worker difficulty to 256 or 512 and not using auto switching does provide better results and less stales (higher efficiency) and you can easily compare the number of stale shares to the 5-chip miner and the 80-chip one and see that for yourself. We also had to try running bfgminer at 850 MHz, a frequency that is the optimal one for Scrypt only mining mode on the 5-chip Gridseed ASIC devices for overclocking without any modifications. Unfortunately the new Gridseed Blade miners do not handle that well the 850 MHz and started producing a bit more than the desirable number of HW errors. As a result of the more HW errors at that frequency the actual performance in terms of hashrate (~5 MHS) decreases as compared to running the miners at 800 MHz, so we do not recommend to go that high with the new ASICs. It is possible that 850 MHz or even a bit more could be achieved after optimizing the cooling of the chips for example, however before actually getting the hardware in our hands we cannot confirm if that is possible or not. So far we’ve been testing with bfgminer with Gridseed support, the standard miner we used for the smaller 5-chip devices and it works very well with the new miner. It might need a minor tweak to report all local hashrates properly, but the actual performance gets properly reported (the third value) that takes into account the rejects and HW errors. We’ve decided to give a try to cgminer with Gridseed support as well to test with and to find the best frequency in between 800 and 850 MHz that can provide optimum results in terms of hashrate and while minimizing the number of HW errors. We were able to get much better results at 838 MHz as compared to what we were getting at 850 MHz and with some extra hashrate reported poolside. The problem when using cgminer for Gridseed is that the locally reported hashtate is incorrectly reported, though the number of accepted and rejected shares and the number of HW errors seems to be properly reported and poolside performance shows that the miner is properly working and only the reporting is not working right. This should be easily fixable with an update on the software miner code in order to properly report the local hashrate based on the number of chips for each of the PCBs in the Gridseed Blade Miner. The good news is that you have some headroom for overclocking the new Blade Miner and squeezing some extra performance out of the box over the standard 5.2 MHS. Then there is also the possibility of implementing an easy voltmod in a similar manner as with the smaller 5-chip Gridseed ASIC devices on the bigger Blade Miner and getting some extra boost in performance up to about 8 MHs. Before actually getting the hardware in our hands and trying out we cannot confirm if this is real option or not, but we already suspect that it might be possible. 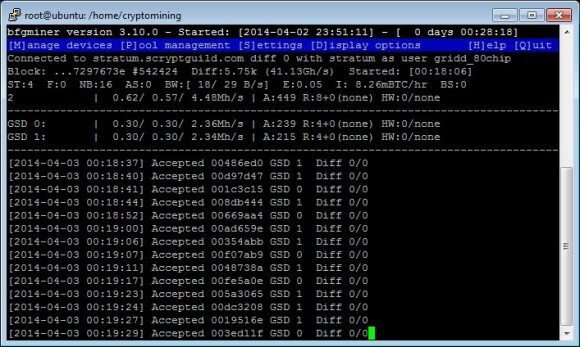 You should not have any problems starting to use the new Gridseed Blade Miner as soon as you receive the device in your hands as it works with the already available software for the smaller miners and if you are familiar with them you should be up and running in no time, especially if you consider the information about the different clocks and hashrate we have provided based on our remote testing. 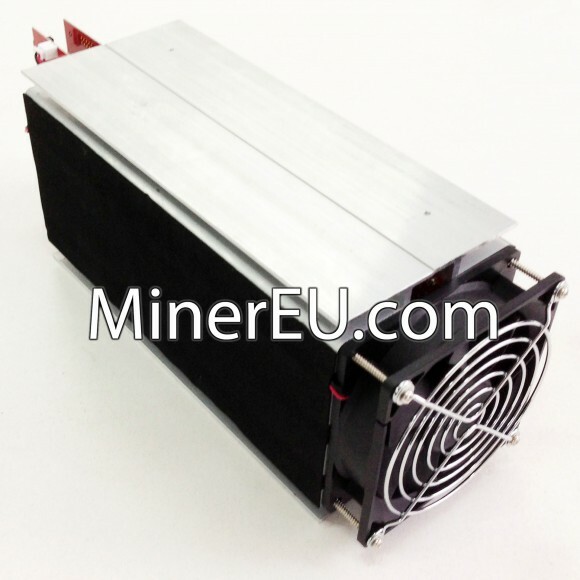 Do note that the Gridseed Blade Miner that we have tested is an earlier unit, so there is a chance that the upcoming units that should start shipping in a few days might be doing even better, though there is no guarantee for that. We are already remotely testing a second Gridseed Blade Miner ASIC device, again remotely in order to compare two of the devices and see if they would behave differently and is there some variance from unit to unit. We are soon going to post some results from the two Blade Miners and these should also be able to give you a good idea on what hashrate you can expect from two of these ASIC devices, so stay tuned for more information soon. Results seem to be relative to the 5 chip devices. You don’t get the advertised 300 Kh/s with them at 600 MHz default frequency either in my experience. Still, the 5 chip devices do meet or exceed the 300 Kh/s at higher than default frequency and are stable as you’ve found with the 80 chip device. With the 80 chip (two x 40 chips) one board failure would wipe out 40 chips. That is the equivalent of eight 5 chip devices failing in a farm made up of 5 chip devices so you are more vulnerable to income loss. Also, if a very interesting new SHA-256 coin were to emerge you could not mine it on this new 80 chip device as the cooling is not suitable for SHA-256 mining even though the chips themselves can mine SHA-256 and Scrypt. The 5 chip devices have those two advantages over the current batch of 80 chip devices. The disadvantages of the 80 chip device are not reflected in the current pricing. What command line did you use with the Gridseed 80 to achieve the 5+ MH/s? i received my unit on Friday and have been playing around with it ever since! Also – i’ve been using BFGMiner – – any advantage of CGMINER versus BFGMINER in general – or more specifically – for this unit? Thanks for the info in advance! C. Smith, nothing special, mining LTC at 800 MHz frequency should easily give you 5+ MHS. If mining at automatic profit switching pool you might see lower performance due to more stale shares and not maximum efficiency if mining coins with lower difficulty. Using cgminer or bgminer is more of a personal preference, you can also try the new cpuminer fork from sandor111.